Since the window of decorating with Seashells for me is a maximum of 4-6 weeks in the summer, I'm kinda low on the scale of said seashell decor. I love having some on display during this "after the 4th and before the late summer-pre fall excitement" season, but living in the middle of the US and the fact that the closest beach is a good 16 hours travel time away, seashells just aren't on my radar most of the time. But...I did get a little hankerin' for some seashell bottle fun for my mantle. I had some old bottles and a few misfit shells, so I wanted to figure out a way to make some "faux soldered seashell topped bottles" on the cheap. Do you remember the song with the lyrics "from a distance"? Uh huh...these work "at a distance". not foolin' anyone up close, but hey...for a few weeks they will suffice. 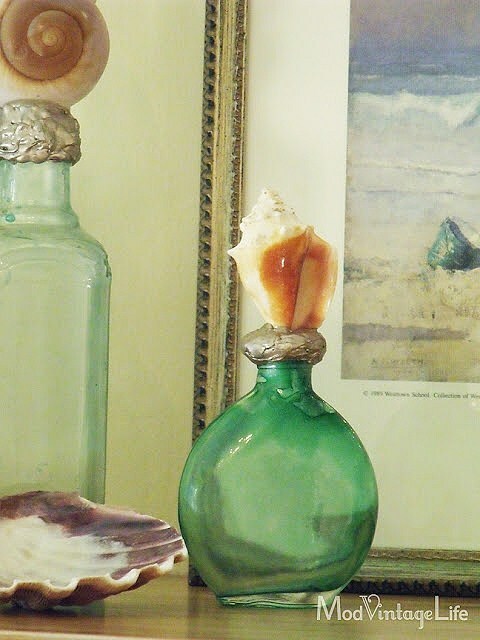 Seashell Bottle tutorial from Nita at Mod Vintage Life. Nita's cool version involves tinting antique bottles, and then using a low temp glue gun attaching the seashell and paint. 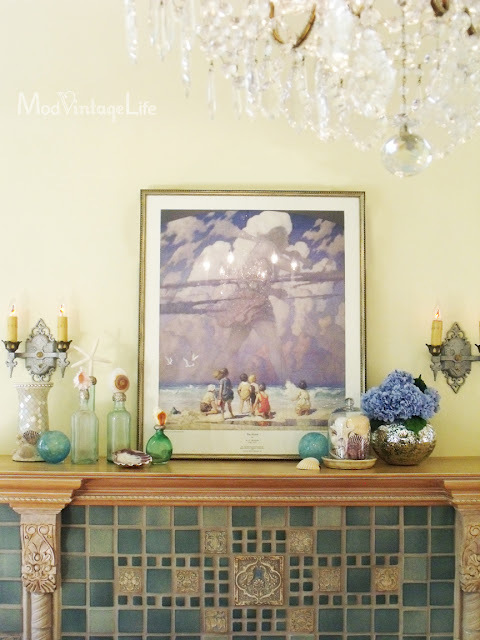 Don't you love how they match her gorgeous tiled fireplace? I decided to keep my bottles clear, and since I didn't have a low temp glue gun, I went with what I had on hand...which was white wood putty. It kept the shell in place without glue and gave a smooth surface. Then after some drytime, I used some bronze metallic paint and a pewter Rub n' Buff mix, brushed on. I know I'm not fooling anyone. gorgeous soldered seashell topped bottles. this "From a Distance" theme seems to be a recurring one. More Living Room Seashell Stuff tomorrow! Love your bottles! I really loved doing this little craft and it totally fulfilled my wish for soldered shell bottles. Love your's with the bottles kept clear. I think your bottles are great from a distance or close up. It's the shell that's the cool part and those show up just fine. Thanks for sharing. I think they look great up close! Enjoy your weekend! I think they look wonderful!! So pretty....I added some ribbon and shells to some Walmart candles that are in clear glass, turned out pretty cute! Great looking bottles, Debra. I think the putty helps maintain that organic feel. They are darling! I'm not near the ocean either, BUT I do love having my giant Jamaican seashells out on tiop of my china cabinet during summer. I have four. And I have a big clam shell which I really love. Nothing but farms around me. Love this! Even though we live in the middle of the woods, we are surrounded by lakes here in Michigan, so I claim shell worthy decor in my home. I have one room that I have a few shells in but mostly lighthouses since Michigan shores have many. Love this look and you did great using what you already had at home. Love the clear glass look. Just because I never know where to stop I might put some sand in a couple of them or a rolled up piece of paper. Thanks for sharing the idea! I think the putty gives it an organic and natural touch that goes perfectly with the shells. Great idea! A M A ZING shell bottles!! thanks for the close up shots. Beautiful and beauty all together. Does that make sense? i'm silly. oh, and I love your new photo's on your header, too! Thanks for sharing! what a great idea! I too like that you kept the vases clear..
A little ingenuity goes a long way at Common Ground, huh, Debra? Just love these! And the thing I like the most is that they don't look like all the rest, and that you found a way to make what you wanted with what you had on hand!! My kinda gal!! Plus...they look fabulous!!! Those look great. Good idea using the putty. I love that clever idea! Sure beats paying the high price of the real thing (using the solder). From another "land locked" blogger...these are stunning...from a distance, dear friend! What truly made my heart skip a beat was the change in your new header...Sunflowers are blooming despite the HEAT here on the Prairie...and yours in the header is gorgeous! Have a blessed weekend, dear freind! I love what you've done. I have a couple of bottles with shells but I need to do some of my own. I live in Florida and have lots of shells! And I love decorating with them in unique ways! Those look so pretty...and they look pretty nice up close too! Debra those look great! You could even leave the putty as is, it reminds me of sand. do with kids out of school... or grandchildren. And love the new photos in the header ! Pretty. They really are a great idea, Debra! Thanks for sharing the tutorial, too. I'm sure many will give it a try! They're lovely. And just the inspiration I needed....we just got back today from our vacation at the Jersey shore and we always come home with, you guessed it, shells! Now I know what I'll be doing with some of them! Thanks! Well since I've never noticed or seen "real" ones, I think these look authentic 'from a distance' OR up close :) Good idea I think to save the shell decor for after the 4th when the decorations come down. I haven't taken mine down yet for that reason -- nothing special to put up until Fall then. "Common Ground" has been included in an edition of Thinking of Christmas Gifts in July for 2012. I hope this helps to point many new visitors (not to mention customers!) in your direction. Even though I'm only about 4 1/2 hours from the ocean, I'm not a big "beach" person--but I really like these bottles! Also (haven't had a chance to tell you)--LOVE the new header! Don't be sayin' that "f" word! (fall--haha) Love your bottles. They are so pretty clustered together like that! So clever. This is so fabulous! Did you link it up at Wow Us Wednesday yet?